Fancy a new musical instrument that you wear on your face, bearing an image that will sear into the consciousness of children and some adults with that of a beast? Enter the Pianowl, the idea of Tara Pattenden who is a visual artist in the field of media, video, sound and installation. 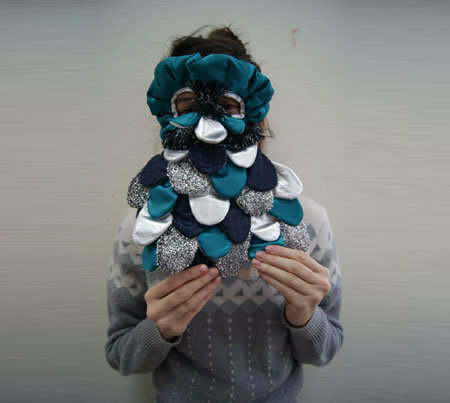 This audio mask is part of her Masters’ thesis at the Aalto Universities Media Lab in Helsinki, Finland. The whole idea would be to create a traditional mask or costume while introducing musical elements, which means soft piano keys have been integrated into this mask that will emit music whenever you press it. Kids would probably run helter skelter when they see this at a campfire story telling session. Did this art student graduate? They never mentioned if he passed or got an A on this project. Just curious because I would not want my kids near any musician wearing this mask when it might be a burglar in disguise. WRONG color. Use browns light and dark. Put feathers on edges to look like a funny owl,then ok.